Every time I watch anything on the Roku that has subtitles with it, it always plays the subs even though they aren't forced and I have to manually go and turn it off. I don't think this is the expected behavior. Is there any way to disable subs unless they are forced? Hi. What is your subtitle behavior set to? Perhaps it is set to "default" and these sub tracks are marked as such? I have noticed that same behavior. The subs even show when I have subs set to "off" on the Roku. 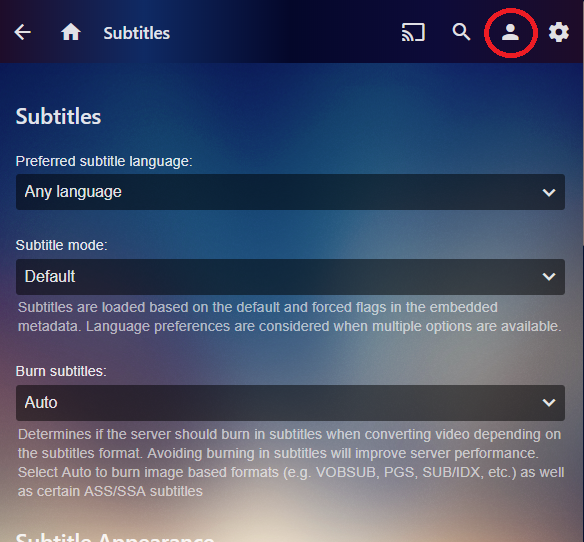 I thought that if your Roku subs are set to off then the internal settings of any app should never override that setting and subs should never show unless you go into Roku's settings and turn the subs back on. That is an apps settings should NEVER override the settings in Rokus menus. I do not mind the override too much but it is a wee bit irritating and quite unexpected. I have been having this issue as well. I keep turning off closed captions and it keeps choosing to display them. Where exactly is the "Never Show Subtitles"? I can't seem to find it in the server config. Edited by KidNamedCudi, 14 November 2017 - 08:46 PM. Ok, now it's March of 2019 and I can't find where to turn the subtitles off the server. I followed the steps above, however those locations no longer exist. I thought I found them in the library settings, but it still shows subtitles and overrides my Roku so every other Roku app shows subtitles. The settings on the Roku app says to check the user settings on the server, but there's nothing there. I missing something? Edited by Knuckles, 21 March 2019 - 06:23 PM. You click your user (red circle above) choose subtitles and exactly what you see above appears. Here is where you tailor to fit. Changes are saved as they are made. Edited by speechles, 21 March 2019 - 06:43 PM. Thank you, speechless. I was going into Users on the side. Completely different screen. Right. This is a user preference so it is accessible to all users from the user settings menu. Where you were looking was user configuration which would only be accessible to admin users.